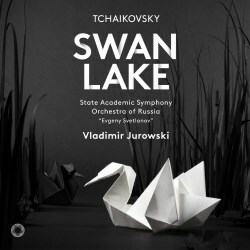 When Neeme Järvi recorded Swan Lake in Bergen in 2012 for Chandos (review), also in superb hi-res surround sound, he too adopted the original score of 1877 but with the addition of a Pas de Deux in Act 3 that was added a year after the premiere. Despite the clear implication that this new Pentatone recording is in some way doing something new by turning to the 1877 score I am hard put to it to see any difference apart from the above Pas de Deux between these two and the much older Boston version under Seiji Ozawa issued by DG in 1979. In sequence of the 29 numbers and in timings there is little to choose. So with some misgiving that I have missed a point somewhere I am treating this latest issue as simply another recording of this great ballet. It is quite clear than the best music is in Act 1 and 2. Act 3 is little more than a divertissement with a short dramatic ending and Act 4 is a grand finale but has much less emotional power than Act 2. Jurowski's very fine performance reflects all this. He has a clear grasp of where the music needs power and where it needs precision, especially in the dance rhythms. I found myself smiling and nodding with satisfaction at all those wonderful details in the Scènes of the first two acts that propel the drama forward. The Russian orchestra, whose full name does not trip off the tongue, sound large and certainly play with fervour as well as precision. Combined with the lovely recording made by the Polyhymnia engineers this set is very much worth hearing. Having started by mentioning the competition in this score I have to say that Järvi and his audibly smaller Bergen band are more spritely in the dance movements and, surprisingly, have at least as much power in the dramatic sections. The majority of the numbers are played slightly faster by Bergen/ Järvi but that is not the only reason for the greater success of the Chandos issue. The Grieghallen in Bergen is a really lovely acoustic and whilst the Moscow venue is good, it does not have as much spaciousness and transparency. Further I think the Chandos engineers have captured the hall sound even more convincingly in their surround recording. If I had never heard the Chandos I would be very satisfied indeed with the new Pentatone. Put the two side by side and the former is simply more appealing to me. The decider, if one is needed, is the quality of the notes. Pentatone's are interesting but lacking detail to guide the listener and the addition of an illustrated guide to making your own origami swan is insufficient to alter the balance. Chandos are exhaustive in their provision of information allowing the listener to enjoy the action all the way through Tchaikovsky's remarkable first full length ballet.